What’s that? You’ve got too much zucchini? (You know you always do in the summer.) 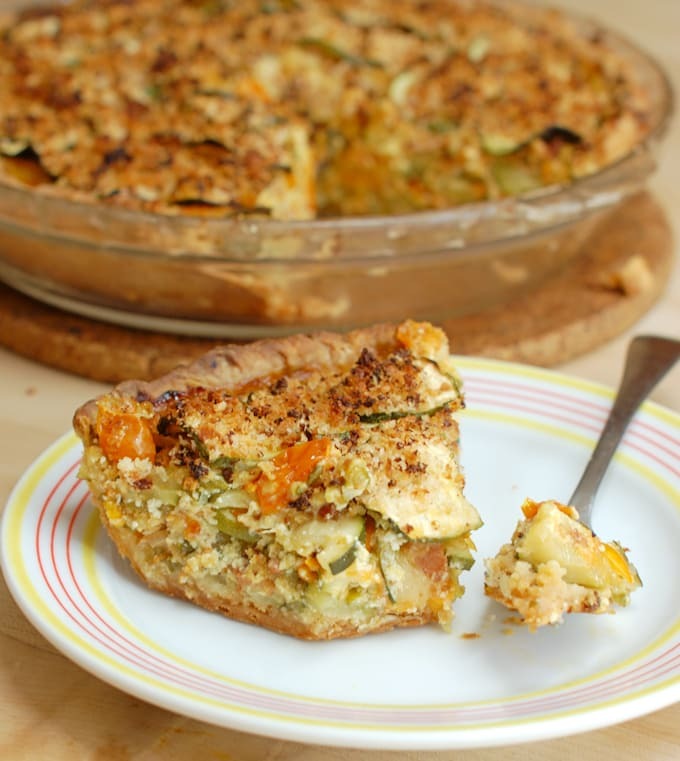 How about making Zucchini & Ricotta Pie – it’s a great way to use a whole bunch of the prolific veggie. 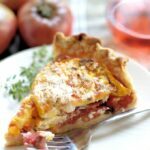 My Heirloom Tomato Pie is one of our favorite summer recipes. 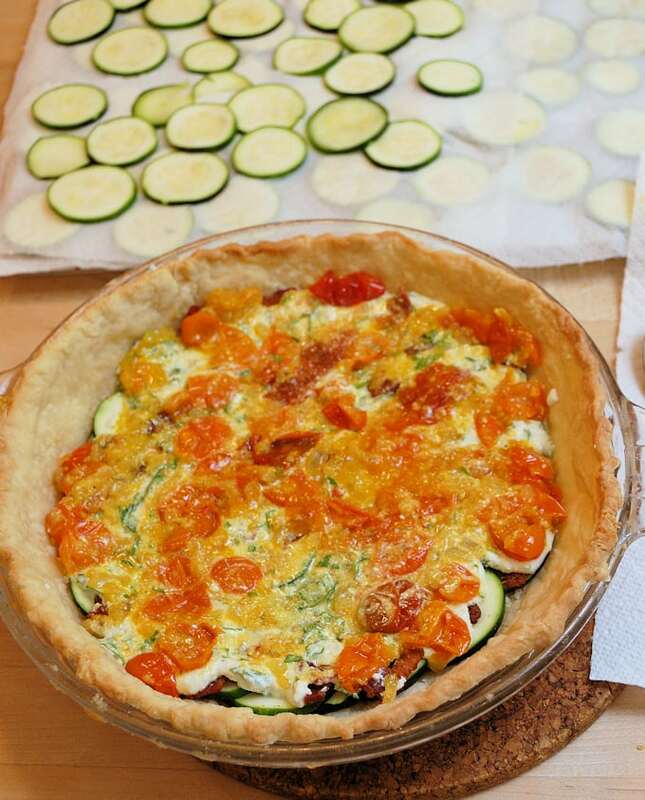 I was thinking about new ways to use zucchini and I thought I’d try making a similar pie using zucchini in place of tomatoes. 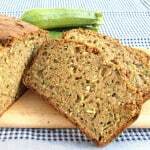 The first time I tested this recipe, in my eagerness to get rid of as much zucchini as possible, I used about 2.5 – 3# of zucchini for the filling. Well, that was a bit much. The pie was mounded so high it went into the oven looking like a Jiffy Pop after it’s been popped. (Do people still make Jiffy pop? If not, you young-uns can Google it.) It also took forever to bake and it oozed all over the oven. 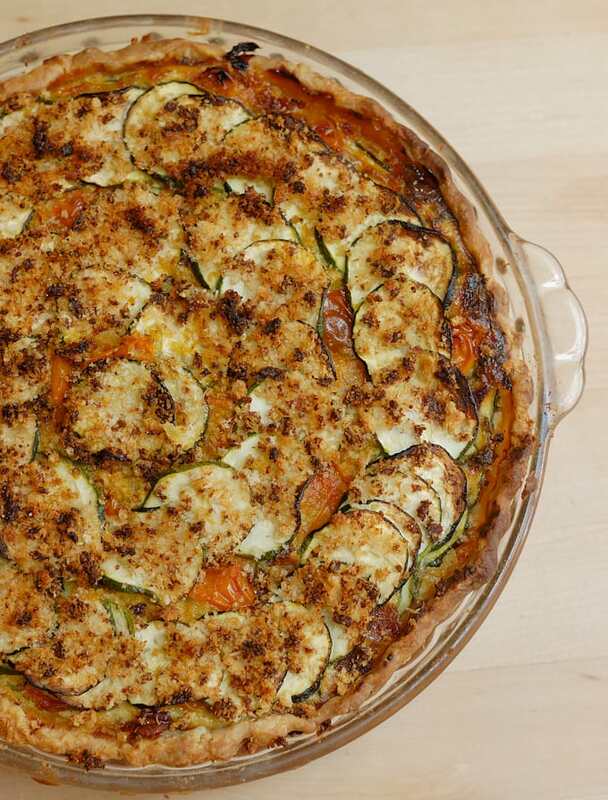 Well, time to go back to the drawing board and revamp the recipe (of course I had plenty of zucchini to make another whole pie). 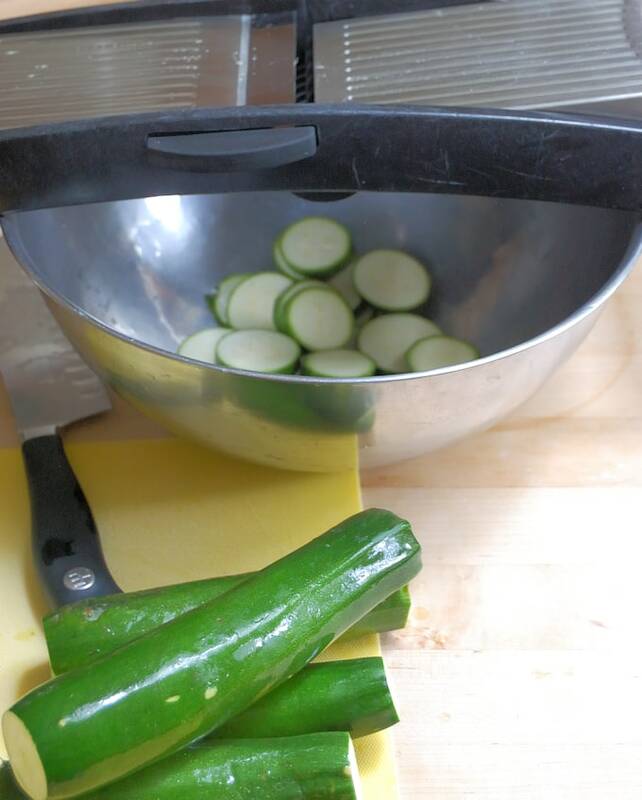 Slice the zucchini nice and thin, about 1/8″-1/4″, and it will nestle nicely into the pie and bake more quickly. Zucchini by itself is pretty bland so I needed to add some flavorful ingredients to the pie. I added ricotta and bacon because, why not? When I made the first pie I added a little leftover tomato puree to sauteed onions for a quick sauce. For the second pie I made the sauce using cherry tomatoes because I happened to have a whole bunch sitting on the kitchen counter. Both pies were tasty, but the cherry tomato version had an awesome sweetness that I really liked. 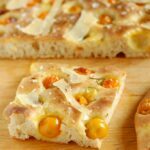 If you’ve got vine-ripened tomatoes of any type use ’em. 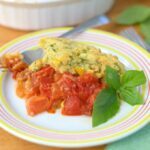 Otherwise, use good canned tomatoes or tomato puree instead. 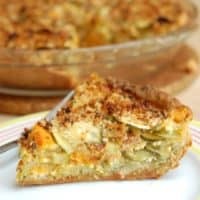 Zucchini & Ricotta Pie is a really delicious way to use lots of zucchini to make a light and healthy summer meal. 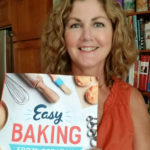 Roll the pie dough and line a pie pan, flute the edges with your fingers or a fork. Using a fork, prick the bottom of the pie shell 10-12 times. Rinse and drain the zucchini and line in single layers on paper towels. Remove the pie shell from the refrigerator. 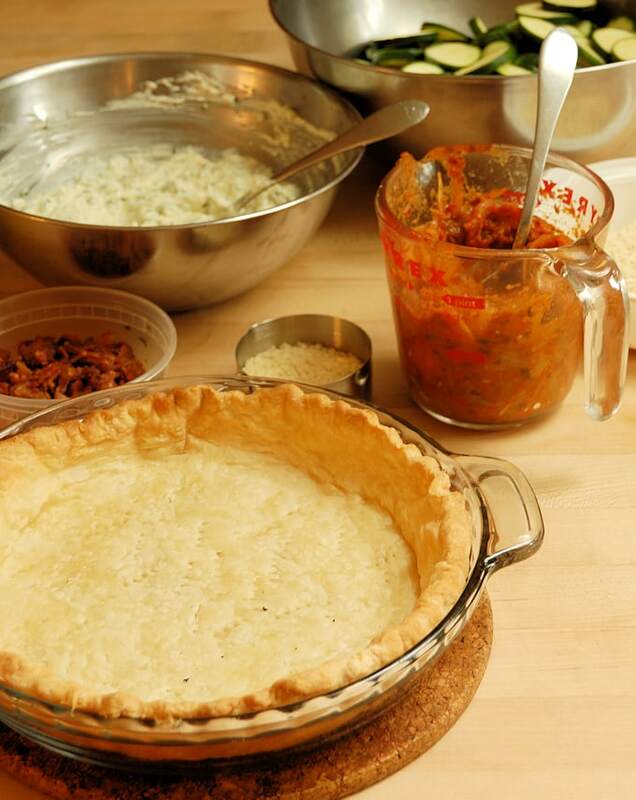 Line the pie shell with aluminum foil and fill with pie weights or dried beans. Press the beans or pie weights all the way across the pan to ensure the sides of the shell won't slip as it bakes. Blind bake the pie shell until the dough is baked through and just beginning to brown. 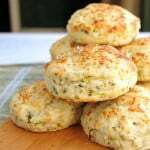 Reduce the oven to 325°F convection or 350°F regular. While the pie shell is baking cook the bacon until crispy and drain on a paper towel. Sprinkle 1/4 cup bread crumbs across the bottom of the pie shell. 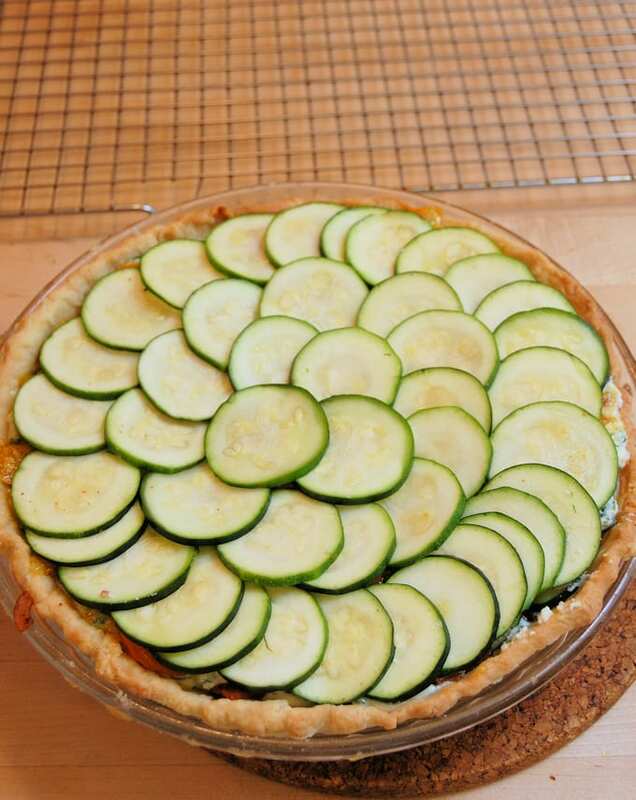 Place about 1/4 of the zucchini slices into the pie shell. Sprinkle about 1/3 of the bacon bits over the zucchini. Bake until the top of the pie is browned and the juices are bubbling. 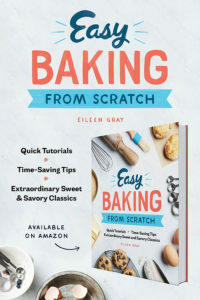 It will probably take just over an hour to bake. Cool for at least one hour before slicing so the juices can reabsorb. Oh wow, this looks simply amazing! 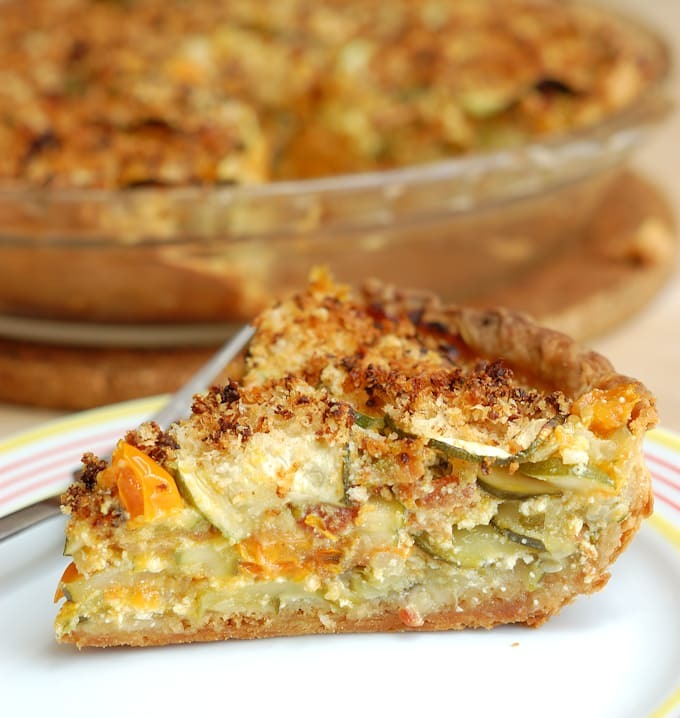 And I love the parmesan crumble topping, it must add a lovely texture to the whole pie.